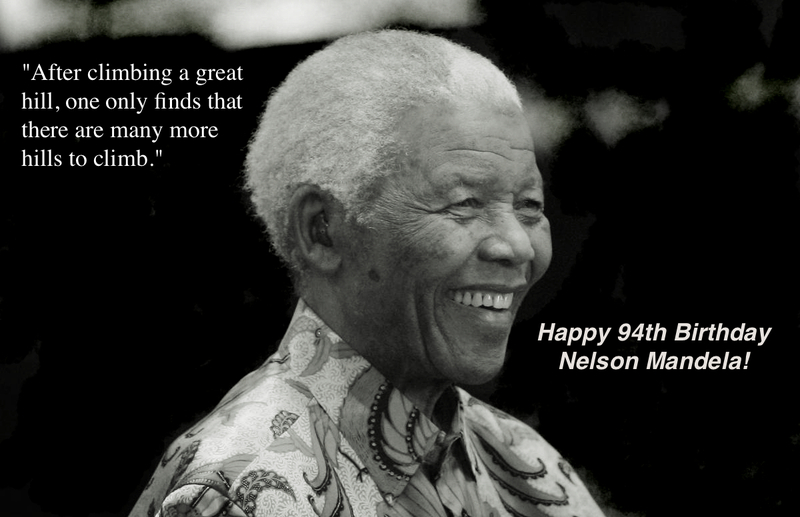 Nelson Mandela was born 94 years ago today in the small village of Mvezo, South Africa. As we reflect on the world’s most renowned freedom fighter and peacemaker on his birthday, we should also reflect on the lessons that he has taught us. When confronted with the challenge of changing the status quo of an entire nation Nelson Mandela showed unshakable leadership. When the decision was made to move from peaceful demonstrations to armed confrontation he knew that he should be the one to lead the armed wing of the ANC, known as the Spear of the Nation (Umkhonto we Sizwe). It was only the trust of his people that allowed Mandela to successfully convince the ANC leadership that the move was right. By putting himself in a highly visible position he inspired his people, and altered the course of history. When Nelson Mandela won the presidential election in 1994 white people across the nation were concerned about the policies that he might enact. Instead of punishing his enemy, he made them his friend, and thus earned their respect and devotion. It is a special man that can forgive the people and regime that imprisoned him for the better part of three decades. If a man who lost so much can forgive, than the rest of the nation could certainly find a way to forgive, as well. Mandela’s actions involving the armed wing of the ANC ultimately led to his long imprisonment. During the Rivonia trial it was apparent that the Apartheid regime was going to try to have Mandela executed on the basis of terrorism charges. Facing death, Mandela did not refute what he was being condemned for, quite the contrary in fact. Nelson used the trial as a pulpit to talk about the Apartheid regime’s actions against his people. He took pride in his decision, and explained that Apartheid had pushed the ANC into a corner where peaceful demonstrators across the nation were coming under fire. He argued that the ANC could only fight successfully by employing the use of equal force. Mandela’s life was ultimately spared, and he was sentenced to life in prison on Robben Island.